Home consoles aren’t exactly the most conducive environment to play a first person shooter, no thanks to clunky controls despite having two analog sticks to thumb around with. 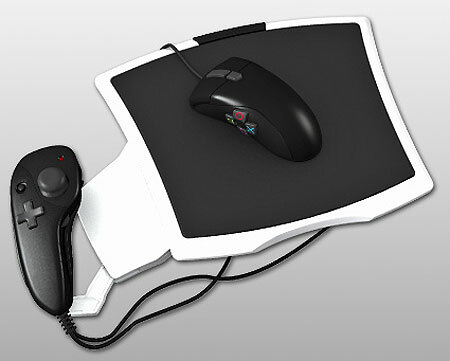 Until today, there is no thing more natural to playing a FPS than using a keyboard and the mouse, but SplitFish GameWare aims to level the playing field by offering the patent pending FragFX controller which consists of a separate right hand mouse controller and a detachable left hand grip controller. Granted, this solution isn’t as comfortable as the computer’s setup, but at least it offers a greater degree of freedom to the discerning gamer and makes those of us who fumble with analog sticks smile. The right hand mouse controller comes with the entire selection of PS3 controller buttons and is used during gameplay to look in every direction as well as execute the all important money shot. When PlayStation Home launches, the mouse controller can also be used for navigation purposes by simple changing the mode. The left hand grip cradle in the meantime contains the SixAxis motion control innards, giving you a foretaste of what the Wii actually offers. Is it just me, or does anyone else notice that the left hand controller looks very much like the Wii Nunchuck? The wired version of the FragFX will be released next month for $59.99 while those who prefer the wireless Bluetooth version will have to wait a slight while longer and fork out an additional $10. For our European readers, will you be holding on until the PS3 launch is well underway before picking up the FragFX game controller, or will you just thumb this gadget and stick to your computer when it comes to FPS gaming? I want my WiFi, and I want it now! Gah…I love being able to use both controllers and KB+Mouse effectively.